Only once have I made a "highlight reel" worthy catch of a foul ball, although I wasn't holding a baby. Our minor league ballpark has a lawn section along the foul lines in the outfield where you are pretty close to the field. Years ago we were sitting in the lawn when the batter hits a frozen rope line drive right at me. I just stuck up my hand and caught it caught it. They put me on the big screen grimacing in pain after the catch. Got a good cheer from the crowd. Don't look now, Pirates have won 11 straight. it's safe to look now. padres have a new promotion. $99 lets you keep coming to games until the padres win 5 games. or until september 30. whichever comes first. I guess I jinxed them. Even though this play ended up costing my team the game, it was still awesome to see. apparently bartman was at the game. The post was edited 1 time, last by max.patch ( Jul 26th 2018, 12:47pm ). Very frustrating since I don't believe Parra would have caught it. And the next batter (Davis again) hit a ground ball that would have scored Bregman. So those two viral video plays made the difference in who won 3-2. But the nice thing about MLB is that it is a 162 game season, unlike the NCAA Big Dance in March where it is one and done. Two interesting videos. In the second one it looks like the ball bounced out of the glove anyway, I don't think it was taken from the outfielder. That is certainly what Bregman thought and he wasn't very happy about being called out after legging out a triple and standing on 3B. I know there are multiple Braves fans on this site. They now have 8 of the top 100 prospects in MLB and 6 of them are pitchers. And 19 of their top 30 prospects are pitchers, so they definitely have an abundance of it coming up. So the question is will they trade some of it to Texas to rent 3B Adrian Beltre for Aug/Sep and hopefully October? Austin Riley "should" be ready for 2019. If I was them I would go ahead and offer to take on all of his salary so it would not cost quite as much in the prospects. So it will be interesting to see what they will do. And if you wondering why the Rangers need pitching help, with Cole Hamels now joining Yu Darvish and Kyle Hendricks, 3/5 of the Cubs starting rotation is ex-Rangers. You're kidding right, why on earth would the Braves want Beltre? He would be a downgrade at 3rd. from the youngster Camargo. Besides current management has stated they'd like to avoid rentals. Gold Glove Hall of Famer for the next two months and especially October I believe it would be an upgrade (but not beyond that). Also strengthens the bench with which ever one of them is not playing that day (Camargo could become Ben Zorbist type utility player also for the rest of the season). Like I said it will be interesting, as the next several years should be again for Braves fans. Yeah, I get a possible (unneeded) utility use for Camargo, but I think the Braves will concentrate on pitching help. Problem is all the contenders want more pitching. There is an abundance of 3B available Beltre, Moose (KC), Fraizer, Donaldson, Valbuena, Gyorko, ect...Now most of those are not improvements, but they still impact supply and demand. And it is not so much Camargo's ABs you would be replacing as it is Flaherty, Culberson, Tucker, ect..
gee, we just picked up venters...isn't that enough? a couple weeks ago the local newspaper sports opinion guy said it was a hard call, but managment "owed" it to the players to get a rental. his opinion was that the players had done their part, and now it was up to management to do theirs. last i read, management doesn't want to do rentals, but would be interested in obtaining the right "controllable assets". personally, i agree with management. no matter what, it's a good problem to have. RIP tony cloninger an atlanta brave from my youth. best remembered for pitching and losing an opening day 13 inning complete game (won't see that again!) and being the only pitcher to hit 2 grand slams in one game (probably won't see that again either). love him or hate him, pete rose makes some good points (and one spectacularly bad one). “What do they say, 'Chicks like the long ball.' Thank God I had some chicks that like the short ball." much ado about nothing...i think the braves announcers need to take a chill pill. and while i can see the advantages of an official batting practive t-shirt -- i bet they'd sell of few of em -- if t-shirts and exposed knees and no socks is acceptable to dodger management then that's the end of the story. The post was edited 1 time, last by max.patch ( Jul 29th 2018, 12:30pm ). mr. iverson, what do you think about the dodger batting practice controversy? There is a reason Larry Brown won a lot more than Iverson did. As someone who has gone to games early (and take my sons) to see batting practice it is nice to see the numbers and names on the players. If you want to cash the multi-million paychecks that the fans pay, you ought to be willing to wear some type of shirt who identifies who you are. As for long pants and socks, I grew up in South Florida, so I wear each the minimal amount I can. Some irony there with Chase Utley's reputation as an old school guy. His slide into 2nd in the playoffs against the Mets a few years back changed the rules in MLB. larry brown still coaching at 77 years old -- recently tool a job as coach of a professional team in italy. 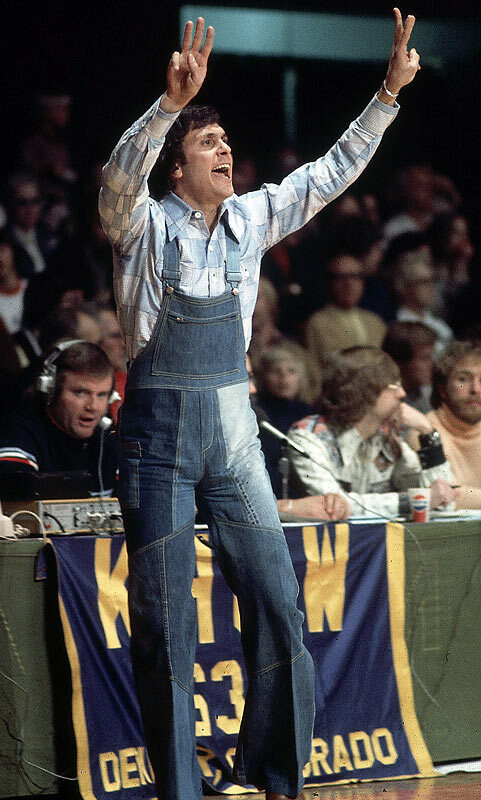 back in the day coaches weren't required to wear suits...there's a picture of him coaching wearing sandals with those overalls that i can't find. I'll go a little further, Joe Simpson should STFU. He's always preaching the "Right Way" to play baseball! What he's too stupid to realize is the "Right Way" is what the team, player's contracts and the Players Association say it is. The rest is just BS. Art Howe visiting in the booth of the Astros game just said back when he played (70-80s) the umpires were on the field during batting practice to make sure the players did not even talk to the players on the other team before a game. Nationals willing to trade Bryce Harper. Lookout for the Dodgers, Yankees, and Cubs. Red Sox don't need him, but then the Yankees really don't either, but that hasn't stopped them before. Who knows being a Vegas guy maybe Arizona will belly up to the bar like they did last year for JD Martinez. Astros willing to trade for Roberto Osuna - look out girls a domestic abuser is coming to a stadium near you. Way to go 'stros! talking head on espn last night said he was shocked that the astros made that move; he thought they were not the type of organization to take on such a player. my initial reaction is that if that happens then the nationals are crazy. but then i remembered -- isn't his contract up at the end of year? he'll probably leave anyway to whoever the highest bidder is. i guess we'll know at 4:00. Now the GM is supposedly pulling it back. That is one way to generate news when you are struggling to play .500. 22 year old mistake by a kid who started working the fields (food not baseball) in Mexico when he was 12 with the right attitude and strong Latino role models in the clubhouse worth giving a second chance too. I just wish they had done as much background work on the the insubordinate nut job who punches himself in the face that they traded for him. I would put a lower chance on him achieving normalcy and success. learned on PTI tonite (and confirmed via google) that the astro's have a "zero tolerance" policy against domestic violence. if ya like analytics...you'll love this. statisticians have developed a cheat sheet to tell ya when it's "safe" to leave a baseball game early. In developing the cheat sheet, we tolerate a 5 percent false positive error rate. Take the 2016 season as an example. The impatient fan who took our advice would have left early in 1,750 games, but in 61 of those games, the eventual winner came from behind to win, and so the fan missed out on some later-inning excitement. For that season, our model attained an accuracy rate of 97 percent. If you follow our cheat sheet, you will leave early in about eight of 10 baseball games. The post was edited 1 time, last by max.patch ( Jul 31st 2018, 7:10pm ). They released a minor league player for it earlier this year. Back when Julio Lugo hit his wife in the Astros parking lot Drayton McLane had him released the next day (never put the uniform on again). Of course Drayton sold the team a few years back. Perhaps they considered this on the Blue Jay's watch, not theirs. Sort of like (or the inverse) of a pre-existing condition with insurance. mets got beat by 3 touchdowns yesterday; mr. met needs a suicide watch. Max Scherzer goes 1 for 1 with an rbi and a run scored and raises his batting average to .292 -- but the reason i'm posting is that he now has a 5 game hitting streak which is pretty incredible if ya think about it. goes without saying that is currently the longest hitting streak by a pitcher in the majors. Really wish the AL would drop the DH. "Real" baseball makes for a much more interesting game.